Way back in January posted about building a DSLR rig for shooting video and I listed some sources that I was using. Well soon after I posted The Rig is Done with a few photos. 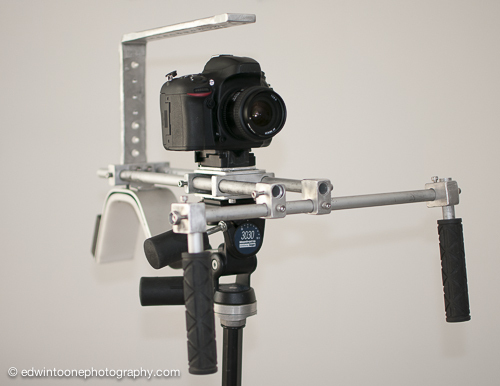 Since then I have used the rig for a few video shoots and even allowed some friends to test it out for feedback. The first thing I noticed was that the rig needed a handle on the top for shooting down low and to make it easier to carry. The cool thing about the handles is that it also creates a good place to connect a mic, light or an audio recorder like the Zoom H4n. The second thing I changed was the shoulder mount. The original just kind of sat on your shoulder where as the new one wraps around your shoulder. Although the rig is great it is too big to carry around a lot. 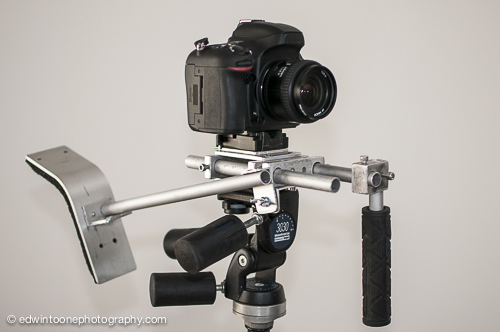 It is designed to use on a dedicated shoot with an external monitor and other gear. It works great for that but I wanted something smaller that would offer some stabilization while not being to bulky. After taking a look at some of the earlier designs I had seen at Ramasola Productions I created my own version of the chest support they have made. This little shotgun set up with one handle from the big rig is much smaller and lighter and does a pretty good job of keeping the camera steady. It is also nice because it puts the camera back right at eye level so you don’t need an external monitor. I am sure with some more testing I can improve on both designs but for now they are a good start!